RCM-1206C-H tubular embroidery machine has 12 needles, 6 heads, 15.7x17.7 inch field, 1000 spm, thread break detection. Ricoma RCM-1206C-H 12-Needle 6-Head Tubular Embroidery Machine. Expand your business and increase your production capacity with RiCOMA's multi head tubular machines. Available in 2, 4, 6, 8 heads and up and with 12 or 15 needles. Suitable for flat bed embroidery, cap embroidery and finished garments embroidery. Embroidery area: 400 x 450 mm, or 15.7 inches x 17.7 inches. 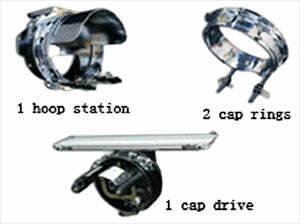 270° wide cap frame unit. 5 inch High Definition color LCD (Optional 8 inch Color Monitor Available) display showing real time stitching. Electricity: 110V/60Hz or 220V/50Hz available. Start, Stop, and Emergency Stop. 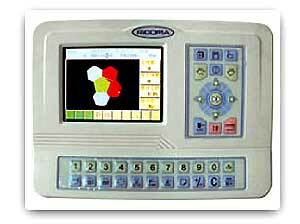 Ricoma RCM-1206C-H Compact Control Panel. 5 inch color LCD (Optional 8 inch Color Monitor Available) display showing real time stitching. Function keys including Menu, Speed up and Slow down (also Page Up and Page Down), Help, Floppy Input, Parameter Settings, Clear, ESC, Enter, etc. Numeric keys for selection of needles. Dot Key to return to 100 degrees. Ricoma RCM-1206C-H Frames / Hoops Included. 2 sets of front hoops of 9cm (3.50 inches) for each head. 2 sets of front hoops of 12cm (4.70 inches) for each head. 2 sets of front hoops of 15cm (5.90 inches) for each head. 2 sets of front hoops of 19cm (7.50 inches) for each head. 2 sets of back hoops for 30cm x 30cm (11.80 inches x 11.80 inches) for each head. 1 Sash Frame for flat embroidery. Ricoma RCM-1206C-H Cap Attachment Included. 270° Wide Cap Driver, 1 set. Snap in and Snap out Cap Change Device, 1 set.